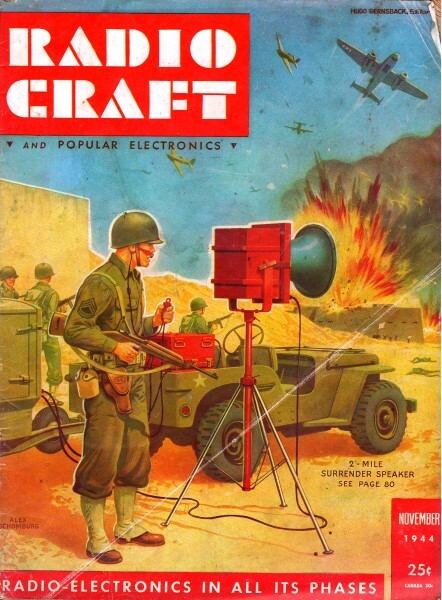 "Sally, the Service Maid" was a relatively short-lived feature in Radio-Craft magazine. It began in early 1944 to bring deserved attention to the women who were left to run their husband's or brother's or son's electronics service shops while they were overseas securing the blessings of liberty for mankind. The sagas involved our heroine, Sally, confidently and impressively attacking malfunctioning electronic equipment in the stead of her father Gus Mason, who had volunteered his services as an instructor of electronics for the military. Unlike in past episodes where she tackled complex radio circuits for dashing military emissaries bringing equipment to her shop, this one finds her troubleshooting the pickup circuit of a wealthy woman's phonograph. Fortunately, electronics sharpshooter Corporal Dan happened to be visiting at the time and lent a hand at finding the solution. 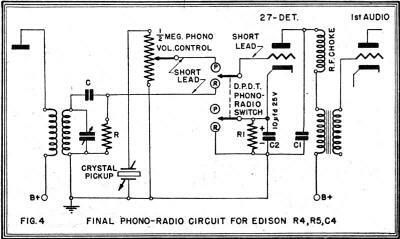 It was Sunday morning, July 2, 1944, and Mrs. Cartwright's gardener and liveried chauffeur were removing the Edison radio combination from the back of the Rolls-Royce parked in front of the Sally Mason, Service Maid radio shop. "You did a splendid job, my dear," said Mrs. Cartwright to Sally Mason. "The radio and phonograph both played better than ever before, after you overhauled them. But now, after only one month, I can hardly hear the phonograph records. The radio stations come in as loud and clear as they ever did. But all I hear when I play a record is a faint scratching sound." "I shall do my best, Mrs. Cartwright," said Sally. No use antagonizing her best customer. And Mrs. Cartwright's daughter, a WAC, was bringing some of the girls home for July Fourth. And her son was bringing home some of his army friends. "You can have the Edison ready, my dear?" said Mrs. Cartwright. "I know it's Sunday. I intensely dislike having you work on Sunday." Mrs. Cartwright smiled. "Double-time on Sundays, isn't it, my dear? I shall be only too happy to pay." The Edison was now in the shop; the Rolls-Royce and its occupants were gone. Although Sally had felt anything but confident of her ability to replace the magnetic pickup with the crystal pickup which she had sold Mrs. Cartwright, her manner was confidence itself. She'd handled crystal pickups before. What was so difficult about installing a crystal pickup? Particularly in a radio as ancient as that Edison. Nothing to it. Yesterday, Technical Corporal Dan Bryner, home on leave for the holiday, had dropped in the shop for a few minutes. When she had told him about the Edison and he had offered to help, she had told him to enjoy his visit with his family and friends. She could handle this job. Why deprive him of his fun? Why make the poor boy work on Sunday, just as she was doing today? Oh, well. She removed the magnetic pickup and checked for continuity. Just as she'd figured when she had played the phonograph in Mrs. Cartwright's home, the pickup was open. Probably burned out. Maybe a lead was broken. But why waste time? She'd already sold Mrs. Cartwright a new crystal pickup. Sally hoped there would be the noticeable improvement in tone quality she'd promised. Crystal pickups were superior to magnetic pickups, so Sally had no doubt Mrs. Cartwright would readily notice the improvement in quality. Maybe even in volume, too. Sally removed the chassis from the cabinet and put it on one of her workbenches. Then she went to her desk and took out the envelope marked "Edison R4, R5, C4." She and the Technical Corporal had made those diagrams. Studying Fig. 1, Sally suddenly had an idea. True, the magnetic pickup, connected across the audio transformer primary, carried high voltage. Crystal pickups could not stand that voltage. Sally drew Fig. 2. There! Condensers C1 and C2 would prevent the voltage from damaging the crystal pickup. Simple, wasn't it? Nothing to it! While hunting for the mica condensers she intended to use, Sally did more thinking. Suppose a condenser suddenly developed a short? Then what? This was Sunday. She had only this one crystal pickup. No, she certainly couldn't afford to experiment. Not under present conditions. Definitely, the crystal pickup had to go somewhere - some place where there was no B+ voltage. But where? Looking through wiring diagrams of crystal pickup circuits had done her no good. They all were used with later radio receivers, which used AVC. 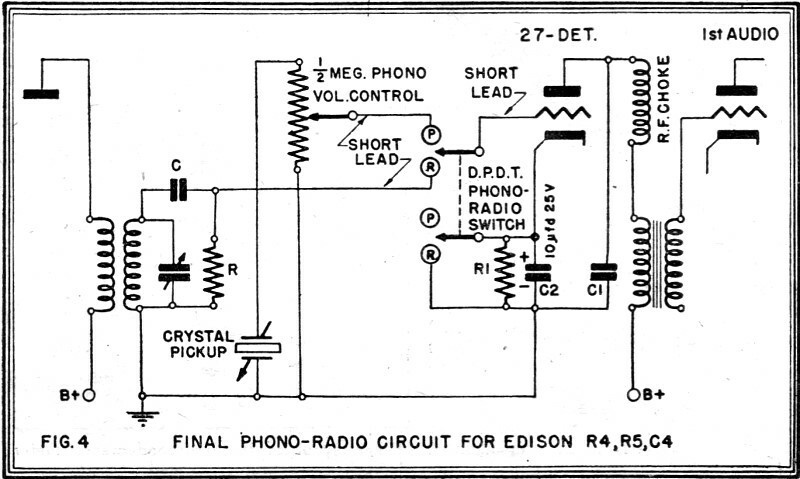 If the Edison used AVC the job would be easy: she'd simply connect the pickup across the center and hot leads of the volume control in the radio. But the Edison had no Automatic Volume Control. Darn it! Suddenly Sally understood what dad had meant when he'd said: The ancient radio circuits are still brand new. to those who haven't learned the old circuits." Dad was right - as always. Dad could handle this job - easily. But dad was a thousand miles away, teaching radio to army personnel. No, she'd never bothered dad with her troubles. And she certainly wasn't starting that now. Besides, she'd promised to finish this job today. And she would have the Edison ready - somehow. Let's think, she decided. Let's think v-e-r-y s-l-o-w-l-y. That had been dad's advice every time she'd been baffled by a difficult radio repair job. She had to use the crystal pickup in a circuit in which there was no B+ voltage. That much was clear. Crystal clear - even if that was a pun! After more thinking and more wrinkling of her straight little nose, Sally drew Fig. 3. There! The Detector grid carried no B voltage, so it was safe to try that idea. It worked! That is, she had to admit, if one didn't mind the distortion and lack of volume and grid hum. Yes, it worked all right - something awful! Shutting off the Edison, Sally disconnected the crystal pickup, then resumed hunting through her service manuals. The only data she could find was for later radio receivers. Why, oh, why had she promised to install a crystal pickup? Why hadn't she purchased a new magnetic pickup, and let well enough alone? No, she had to be smart! Sally Mason and her bright ideas! Well, what must be done, must be done! She was licked, and she knew it. The ancient circuits were worse than the most complicated brand new ones. If only the Edison had AVC, or something! She hated to do it, but she had to ask Technical Corporal Dan Bryner's help - again! He came right over, a surprised look on his tanned face. But he said nothing, except: "Good morning, Sally. What's worrying you today?" Sally shook her head. "I'm supposed to install a crystal pickup in Mrs. Cartwright's Edison. I've tried. But I just haven't had any luck. Oh, I've had luck - all bad!" She showed Dan the drawings she'd made, the bright ideas she'd tried. "I see," he said after a long silence. "I see. Fig. 3 shouldn't have had all that hum - the pickup cable is shielded. Hey - did you ground the shield, or did you connect it to the detector grid ?" Sally waved her hands. "Why ask me? All I have is bright ideas - which never work!" Dan borrowed a pencil and a sheet of paper. A few minutes later he showed her the diagram he'd drawn. "Fig. 4 is what we need," said Dan. "Any double pole" double throw switches? Rotary, or toggle switch will do." Sally brought him two switches. "Take your choice. I have one of each; one rotary, one toggle switch." "Better use the rotary switch," said Dan, "with a pointer knob and a Phono-Radio nameplate. Looks better. We can mount the switch in the hole we made for the other Phono-Radio switch. Is everything in Fig. 4 clear to you? After all, understanding the theory involved in this job will help you when similar jobs come along. They will, sooner or later." Sally studied the diagram, wrinkled her nose several times, then said: "We've got shielded wire - even a few feet of coaxial cable, for the short grid leads. Want 'em?" Dan shook his head. "We may not need shielded cable. If we do, we can replace the ordinary insulated wire, later. But the diagram, Fig. 4 - is everything clear to you?" "Y-e-s," said Sally, hesitantly. "I can see that the detector grid goes to its original circuit when the Phono-Radio switch is on radio, and the cathode is grounded. That's just as it was originally. But why the electrolytic condenser and resistor R?" "Because the detector tube is not a detector when we switch to phono," said Dan, grinning. "As this isn't a superhet, it can't be I.F. It isn't a detector. So, what can it be? Doesn't the electrolytic condenser give you a hint?" Sally sadly shook her head, "Today," she said, "I am dumber than usual. Much!" "Audio! Nothing else is left. Or is there ?" Dan laughed. "Right! The detector tube becomes an audio frequency tube, on phono. Now - what's the value in ohms of cathode resistor R?" After some thought and more nose wrinkling, Sally said: "Now lemme see. Audio. I know - the same as the cathode resistor in the first audio stage! Right?" "And I was going to calculate the value!" said Dan. "Although the plate voltage is lower on the detector than on the first audio tube, the same value should be okay. Let's try it. And where's that half megohm volume control?" The job took very little time. "Now let's try it," said Dan. "I may have left off a lead-or maybe we'll have to use shielded, or coaxial cable. We'll know ... soon." The tubes heated to operating temperature and Dan switched to radio, tuned in several stations, then nodded his head. Then he switched to phono and played a record. "Wonderful!" said Sally. "More volume and much better tone quality than I'd dared hope for! Thanks a million, Dan." "It's okay," said Dan. "I enjoy working on radios - maybe that will help me remember the little I've learned." He started for the door. "Well, so long, until next time." Sally, standing in the door of her shop, watched him swing with a military stride down the dust-covered road. 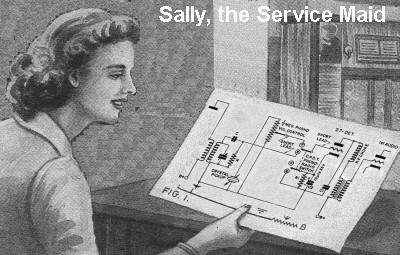 "If he can only dance," she mused, "as well as he can fix radios ... "
Sally turned back to her bench, humming a little tune as she started to work on an intermittent Emerson.